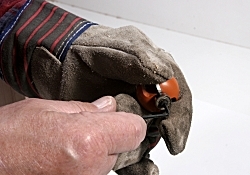 A gardening glove can be used the first time you remove the bearing from a bearing-guided cutter. 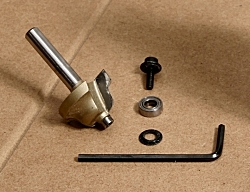 The Allen screws holding the bearings are often very tight from the factory and without protection you can easily take bits out of the ends of your fingers. Bearings should be removed from cutters when cleaning and honing. This enables the cutter to be cleaned and honed properly without the risk of any solvent you use getting into the bearing and driving out the packed-in lubricant. It also enables the shavings and other muck that gets trapped between the bearing and its washer to be cleaned off. The outer edge of the bearing can be wiped clean with a rag damped with solvent if there’s resin on it. If you use WD 40 for cutter cleaning, be very careful not to let any get into the bearing. It will soon drive out the bearing’s built-in lubricant.